There are some musicians who aren’t intimidated by any instrument. You can put them in a studio filled with tools they’ve never seen and they can pick them up and write something immediately. Density and studio console programming is their second language, they’ve been compelled to study ancient synth manuals and track down functioning archaic equipment on ebay just to hear it. Not that any of those things ever make it into their sound, it’s just a constant desire to experiment and figure out what makes it tick. Electrical engineers built things with no intention of them ever being used that way. 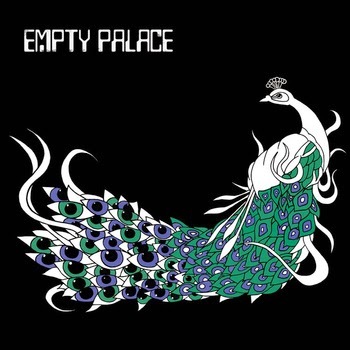 Empty Palace, a five piece out of Los Angeles sounds like one of those bands. How the five of these guys found each other has to be because no one else could keep up with their individual references of glam, metal and progressive rock. "What do we tell the family" opens on atmospheric synth that harkens back to Journey or is that Judas Priest? It’s a produced towering prog rock - dare I mention Rush? Shades of that hard rock combined with a heavy dose of mechanical skill. A subtle bass line and wheezy organ with glam that’s decades beyond T-Rex. They want you to get used to their '70s progressive sound of piled on effects and theatrical changes embellishing every measure, like some kind of fancy museum of how the other half lives past the velvet ropes. Guitars line up layers of distortions to get a synth crazy future sound, like pieces of Queen’s stiff operatic stuff. I get the impractically ornate peacock on the sleeve now. "Human Trampoline” is some sick medical doctor’s idea of sewing people together to jump on them. I think I just heard the lyric ‘laser fight’ as drums go onto a hyper jagged rhythm. With this metal scream, they change tempos and compact melodies at the drop of a hat. This can’t be related to by mere mortals, no wonder Rush started dressing like weird aliens from outer space. That's exactly where these guys have to exist - piling on concepts and untried hypothesis over one another. Their angelic epic prog has a metal foundation of screechy chords and harmonized distortion elements trying to sound as otherworldly as possible. This kind of thing can almost be offputting the way it's so impossibly technical but then no one can help but stare at an accident either. It’s a spectacle in the form of a 7” single. B-Side" I Liked The Old You Better" and I like their equally epic song titles. An organ rises out of the mist, the bass and kick line up in an odd tempo with a vocoder twisting up space. That instrument (?) was invented for this kind of sound. You have to commit to their ride, it's not going to be easy to bang your head to, but it’s appreciated by people who can work on this level. I definitely respect the amount of production that goes onto this. There's no way you could tell me this was recorded in someone’s parents basement with garageband, there's no setting for this overwhelming density. They seem to drop back out to nothing and let their main melody reemerge in bizarre ways like these vocalizations off in the echo of toms and swirly synths. Maybe I'm getting that grandiosity of Rush from the pieces of lyrics, they're really going for this whole ornate package, leaving nothing to be misinterpreted. 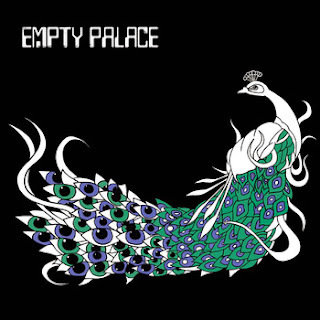 A guitar solo peaks out of the sludgy metal opera and these tracks could evolve into a concept album about an alien planet where rock didn't exist so Empty Palace got together but were hunted down after one show. They were exiled to earth and recorded a record. They’ve actually just finished recording a full length but this red marble single will be your introduction to these guys from Snappy Little Numbers Records.